Home hush hush patch waiting on wednesday Waiting on Wednesday! Hey guys! So we decided to participate in Waiting on Wednesday. Waiting on Wednesday is a weekly meme created by Breaking the Spine. We decided to get in on the action. Waiting on Wednesday is where I show you my most anticipated upcoming book. 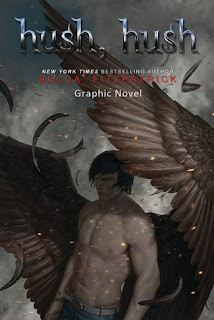 My most anticipated book is Hush, Hush, the graphic novel. As you all know, I absolutely love Hush, Hush, especially Patch. For Nora Grey, romance was not part of the plan. She''s never been particularly attracted to the boys at her school, no matter how much her best friend, Vee, pushes them at her. Not until Patch came along. With his easy smile and eyes that seem to see inside her, Nora is drawn to him against her better judgment. But after a series of terrifying encounters, Nora''s not sure who to trust. Patch seems to be everywhere she is, and to know more about her than her closest friends. She can''t decide whether she should fall into his arms or run and hide. And when she tries to seek some answers, she finds herself near a truth that is way more unsettling than anything Patch makes her feel. For Nora is right in the middle of an ancient battle between the immortal and those that have fallen - and, when it comes to choosing sides, the wrong choice will cost her life This title also contains an exclusive, original story written especially for this book by the author. This bonus story tells what happens to the characters between Book 1 and Book 2 of this series and will only be available in this book. I love the Nora and Patch, and I am super excited to find out what happened in between Hush, Hush and Crescendo. Yep. That's Dexter. She just started it, but she loves those kinds of books! stop by my blog?! I have lots of picks this week!